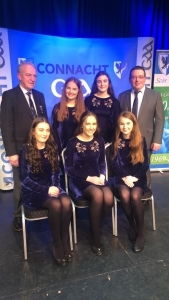 A fabulous evening for St Marys, Leitrim regaining their Ballad group title in this year’s Connacht Scór na nÓg. The finals were held last Sunday in Claremorris, Co Mayo. The newly introduced Connacht round of the quiz was held as the first event of the day in Claremorris GAA clubhouse. Ballinamore Sean O’Heslins faced the four other Connacht county teams for a provincial round with the Leitrim team finishing with an impressive 51 points. Roscommon winning the Connacht medals for 2019. All 5 county teams will participate in the 32 County All- Ireland quiz on February 16th in Castlebar at 11am. Entrance to the quiz is free of charge. The first Leitrim competitors to take to the main stage were St Marys Carrick on Shannon in the Figure dancing. The team gave a super lively and polished performance. Having reached their first All-Ireland last year in Sligo, there was great anticipation for a 2nd qualification for the young team. With Leitrim, Roscommon and Mayo all having competed in All-Ireland in the last 3 years, it was going to be a tight finish. St Dominic’s of Roscommon were chosen as the Connacht Winners. 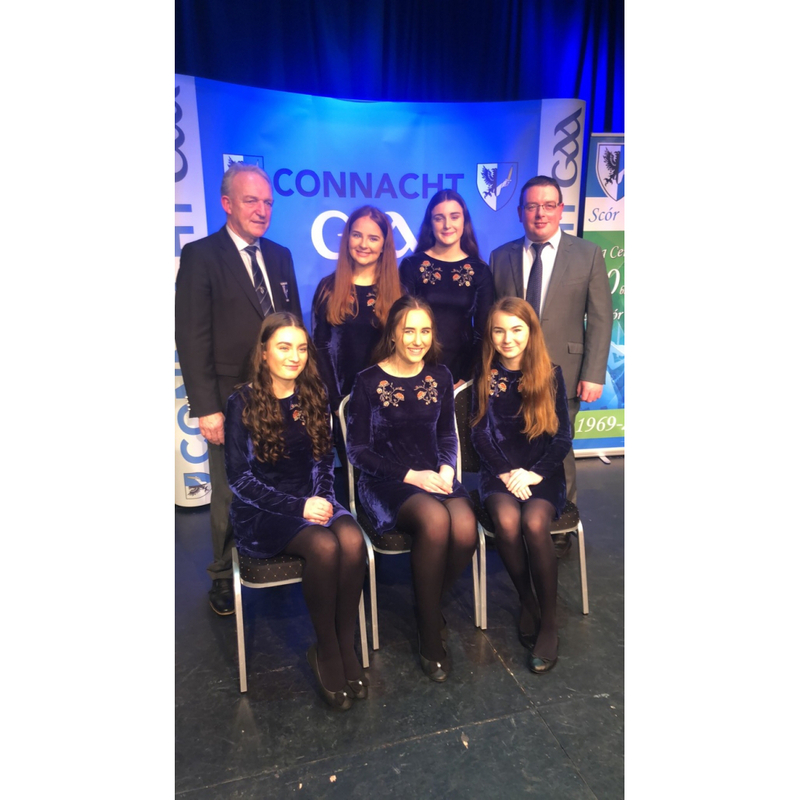 In Solo Singing, Amelia Pajak of Mohill made her second appearance at Connacht level. Nerves didn’t play a part on the day for her as she gave a beautiful solo. A tight competition with some beautiful singers with varying styles, Ellen Keane from Galway emerged as the winner for the singing adjudicator. Recitation was a very entertaining competition, from witty tales to old fables and storytelling, each act giving a different slant on the variety of material available for this competition. St Marys Michael Connorton represented Leitrim for a third consecutive year in a bid to earn his title. High credit to the young man on a fantastic performance. He had great deliverance and poise on the stage and received a very positive return from the audience with cheers and applause. Evan Gunn from Elphin, Roscommon was the judges’ winner on the day. A fabulous win for St Marys Ballad Group gave an outstanding performance. The Carrick girls clinching their 4th Connacht title were thrilled to be representing Connacht & Leitrim at the All-Ireland once again. Kiltubrid represented Leitrim in Instrumental Music on Sunday. A first for the club reaching the Connacht final having been knocking on the door for a number of years. The musicians received fantastic rapture from the audience but unfortunately with stiff competition, not the judge’s choice. The musical arrangements they brought to the stage and the array of instruments the young people play with ease, was certainly to be admired. Corofin of Galway lifted the title in Instrumental Music. Aughnasheelan made a comeback in this year’s Leiriu competition. A great witty performance was given by the young team, however, the winner for a third consecutive year was St Dominic’s of Roscommon. Annaduff were first to dance and set the pace for Rince Seit. The 8 young ladies delivered a solid performance at their Provincial debut but the title went to stalwarts of Scór, Abbeyknockmoy, Galway. The All-Ireland Finals will be held in the TF Royal Theatre, Castlebar on February 16th at 3pm. Please note it is a ticket only event, tickets are priced at: Adult: €20, U16:€10. Family pass: €60 (2adults &2 children) Tickets once ordered are non-refundable. They can be ordered through; Claire Crossan 087-6472547. Or through club Scór officers. All orders must be placed by Friday January 25th. Wishing – St Marys, Ballinamore Sean O’Heslin’s and all of the Connacht winners the very best of luck at the All-Ireland final.